(June 19, Hong Kong, Sri Lanka Guardian) This video is about three women. Angkhana is a woman from Thailand, a lawyer. She was married Somchai, a well known lawyer in Thailand. They have several children. One day, Angkhana learns that her husband has been abducted. He has been dragged out from his car in Bangkok. He is missing. From then, another chapter opens in her life. First she tries to look for her husband. She knows that he was involved in, among other things, dealing with the cases of several torture victims who complained of severe abuse by the security persons in Thailand. It was when he was preparing evidence to be filed in court on their behalf that he went missing. She turns to the state and inquires about her husband. Within days, it becomes clear that the abduction had been done by the state and it becomes even clearer that in the kidnapping the prime minister himself has at least some indirect knowledge. In the subsequent years, the state has not answered her questions about the whereabouts of her husband or what happened to him. Soon it becomes clear that it is a case of forced disappearance. The only people who helped her in her search for her husband are several human rights groups in the country and outside. They make a determined attempt to ask for accountability on the part of the state. Then she began to understand integrated network of enormous secrecy surrounding her husband’s disappearance. There is an enormously organized attempt on the part of the state to deny information to keep the entire process severely under secrecy. With protest, it goes on for a very long time. She is promised some enquires, but these inquires are wholly inadequate. And then there is the legal process. For years and years, the legal process drags on. Ultimately, one person is sentenced for three years. However, the details of the whole process are kept hidden. She tries to get information about what has happened to her husband, and where the body is if he is dead, or any part which can be found. However, the response of the state is entirely minimal. For most part, no real reply is given to her by the state. Here is a woman whose husband has been taken away without any legitimate reason. She has reason to believe the state agencies have killed her husband. And further, the entire system of justice is unwilling and unable to deal with her problem. She is a citizen. She is supposed to have all the rights like any other citizen in Thailand. But even on this most elementary issue of the right to life of her husband and her right to know information about him, the state is plays a completely negative role. The state becomes the killer and also the one who hides everything from her. The second is a case from Indonesia. Suciwati is an Indonesian young woman. She is a worker. Being involved in the trade union movement, she came across a man who is passionately committed to the rights of workers and who is an ardent human rights activist. She is attracted to him because he is brave and kind and an honest person. They get married and they have two children. He is a deep family man and they have a happy family. Her husband, Munir, who wants to do a greater service to the country through the field of human rights, wants to learn more and gets a scholarship to Netherlands. He leaves with a determination to spend years learning in order to prepare himself for the future. Soon before he leaves, there was a man who inquired about his leaving and offers to be helpful. He departs in an Indonesian airline, belonging to the Indonesian government. Next she hears that he is dead. As the time goes by, she learns that the death has been by poisoning while he was in the plane. It becomes a clear case of highly organized murder. There is huge protest in the country in which many join and demand inquiries. It takes years. Once again, the Indonesian state, very much like the Thai state, engages in secrecy. There are all the attempts to cover up the murder, and to protect the murderer. Once again, it becomes clear that the state is involved in the killing. And the state is also involved in trying to protect the killer and to deny information to this woman. Years and years of struggle later the court gives an order, and the order was to acquit the accused. Once again there is protest and with enormously powerful protest, there is another case filed, the earlier verdict is overturned and one person, the man who worked at the airforce, a secret agent, is found guilty. He is sentenced to 20 years. However, those who organized the killings, the more powerful ones, are being protected. Again there is protest; however, there is no attempt, by the state, to give details about the total circumstances of the killing. Again this woman is a citizen, and like others, she has all the human rights in name. But her husband is killed by the state. Her children had been denied their father, and all the responsibility of bringing up her family is on her shoulders. She is denied by the state a proper inquiry into the murder, although the state owns a responsibility to investigate all crime. It takes years and years to get anything moving. Finally, the justice system itself betrayed this woman. What do her human rights mean to her? When the basic rights that should have protected her husband has been denied, the basic right of the children to have their father has been denied, basic right of her as a woman to have her husband has been denied. Other than that, the state itself engages in a struggle to deny information. Worse still, the justice system also betrays her. The third woman is from Sri Lanka, Padma. She has a loving husband and two children. Both children are very young. They have what she says is a happy family. One day police officers virtually restrain her and put her in a jeep and tried to force her to bring her husband from work. She is told that her husband is responsible for triple murder. When her husband comes, he is arrested and soon severely tortured by police who tried to find information about the murder. It turns out that they have arrested the wrong man and then have severely beaten up the wrong man. Due to the beating, he suffers severe kidney failure, and is admitted to hospital while unconscious. The entire burden of fighting for her husband’s life, which threatened by the officers of the state, is forced upon her. Her struggle is supported only by a group of human rights activists and some friends, who attract the attention of doctors. She is thereby able to save the life of her husband. On his return, a fundamental rights petition is filed and the Supreme Court finds the police officers to have violated the rights of her husband and makes a landmark judgment, from the viewpoint of law. However, later there is a further case against these police officers, and in order to save themselves, they shoot her husband on a public bus on his way to work. There begins another struggle for inquires and after severe attempts, some inquiries take place. However, the years of litigation before court, and the court finds the accused not guilty. The entire process of justice is denied in relation to the torture and the murder. She is denied of a loving husband, her children are denied of father, and the entire burden of bringing up the family falls on her. And all the burden of denial of the right to life for her husband and all other problems created for her have been done by the state. And the justice system denies any kind of justice. She too is a citizen; she too has human rights like others, and what do her rights mean to her? There is murder, there is complete denial of justice, and the entire process is one of complete absurdity. In this agonizing absurdity where her life is caught, what do human rights mean to her? What do human rights mean in the absence of justice? In the case of Angkhana of Thailand, Suciwati of Indonesia and Padma of Sri Lanka, we are faced with profound questions about the nature of society and the very meaning of life and the place of justice. Human rights are based on the fact that the state has the obligation to protect the citizen’s rights and guarantee these rights for all. However, in the lives of the three women mentioned above, we have seen that the state has become the killer and denied them the rights they are entitled to. The state in all three cases is different as they come from three countries but the fundamental problem is the same: That problem is that the state itself has become the killer. When rights are denied, the state is supposed to investigate into that matter and engage in an exercise of restoration of the lost rights. The restoration may not result in the perfect return to the situation before the violation, but the restoration is supposed to deal with all the issues relating to violations and bring about trust within the individual of once again being placed back into a normal situation of living. How does this operate when the state itself is the killer? That is the very issue that these persons from three different countries are faced with. The third aspect is that in the event of the denial of rights by one part of the state, which is the executive, there is another branch that protects rights: the process of justice. Now the agents of justice are behind the killings. The security forces also happen to be the investigative branch in matters of justice. In these cases, at the very inception, the inquiries are denied. In this instance it is the judiciary that has to intervene powerfully against the executive so that the wrong done by the executive is cured by the judicial process. The very essence of justice therefore is that it has the capacity to correct wrongs done by the executive branch. However, in the case of these three women, the judiciary does not have any such power. The judiciary offers many rituals. There are trials, witnesses are called and various things happen. However, they are nothing beyond rituals and have no deeper or profounder sense of meaning. At depth is the issue of the denial of justice. Justice is denied because in these countries justice is incapable of being justice. The judiciary is incapable of being the judiciary in the real sense of the term. What you have is some kind of a phantom judiciary acting as if they have some kind of power when there is no real power. Then all these three women are victims of the absolute power of the executive that engages in the denial of rights and there is no protective arm at all within the state to help them. Their only refuge is civil society. However, within civil society too there are only a small group of persons who exercise solidarity and friendship towards them. These people share the same powerlessness as the three women. Here are groups of citizens sharing equal powerlessness giving support to each other. There is value in their protests, there is psychological help in small groups, some kind of final human bonds between groups of citizens. And all are equally powerless. Below is the vast civil society of the country which neither understands nor intervenes in this whole process of problems created by the executive. In many ways they are uninvolved in the whole process, in a conscious sense. However, they are all involved in the denial. There is a pretended ignorance, indifference and lack of involvement. The story of these three women is not just their story. It is the story of all persons who have been subjected to human rights violations. 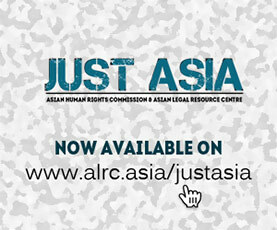 When a justice framework does not exist, what do human rights mean? Beneath that there is a further and deeper problem. What does the term, ’women’s rights’, mean in the absence of justice? Women too are part of the same society. They are human beings. Protection of their rights requires that there is a protective mechanism within the state. When the justice mechanism has been killed, what is the protective mechanism for them? Can that aspect be completely ignored when we are discussing the rights of women?